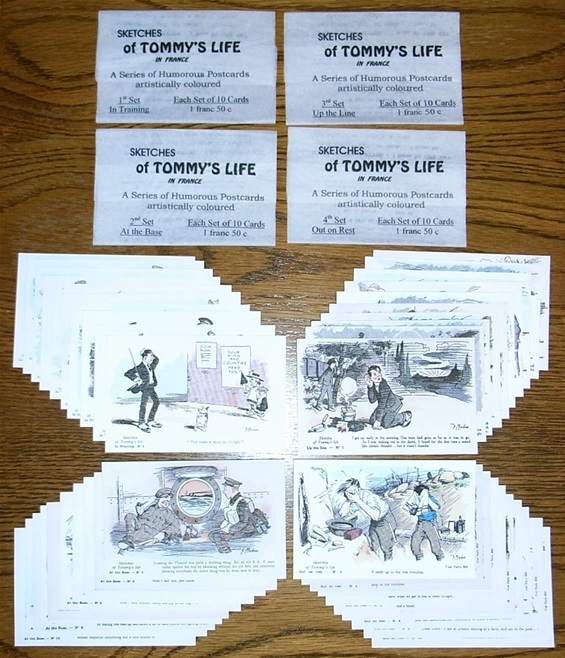 The "Sketches of Tommy's Life" post cards were a popular brand produced during the war. 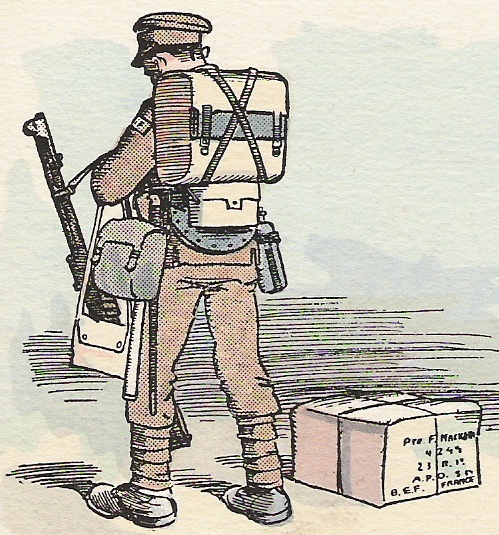 They were illustrated by Fergus Mackain, who had served as a Private with the 23rd Battalion Royal Fusiliers (landing in France in April 1915), but otherwise little is known about him. Obviously based on the artists first hand experience, they accurately depicted what it was like to be an infantry soldier serving on the Western Front, from his first experience of training and the inevitable trench warfare that followed, yet done in a light hearted and humorous manner that still appeals after nearly 100 years. Originally published by G. Savigny of Paris and P. Gaultier of Boulogne relatively cheaply, they were sold in their 100,000's to officer's and men alike. Available to buy is a complete set of 40 reproduction WW1 postcards of the "Sketches of Tommy's Life" series by Mackain. This comprises four individual sets - "1st Set - In Training", "2nd Set - At the Base", "3rd Set - Up the Line", and "4th Set - Out on Rest". For better pictures of the actual cards please see my other pages for the individual sets (which can be purchased seperately if required, but there is a saving if purchased as a 40 card set). Each of these sets themselves comprises ten cards (making 40 cards in total) with each set also having a tissue paper wrapper. These are high quality copies printed to the same size as the originals and can still be used today if so desired. Why struggle for years to acquire the complete set which will invariably be worn or mismatched to a greater or lesser degree when you can get the complete set in one go in mint shape for a fraction of the cost? Each set of 40 cards costs £30.00, plus postage and packaging. 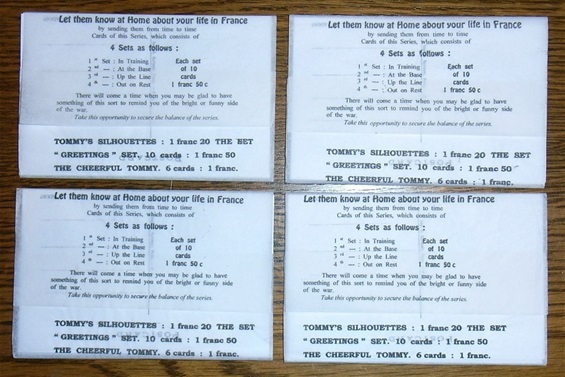 Complete wrapped set of "Sketches of Tommy's Life", front. Complete wrapped set of "Sketches of Tommy's Life", rear. 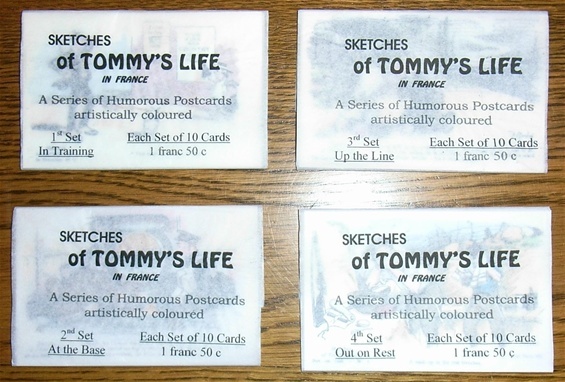 Complete set of "Sketches of Tommy's Life", cards exposed.